A novel fluorescent probe library is developed by a research team including scientists from the University of Electro-Communications, Tokyo. The findings are published in the journal Analytical Chemistry. Probe library yielded GST-specific CCTO probes, which change color from yellow to cyan when they bind. The color-change ability is most highly prized, because an obvious signal such as this can result in less ambiguous read-outs when searching for specific targets. The ability to visualize, detect and track specific proteinsis highly desirable for scientists working in a variety of disciplines, such as disease diagnostics and cell biology. To this end, ‘fluorogenic probes’ are often used – molecular dyes which bind to target molecules and fluoresce in response to the surrounding microenvironment. Some probes hold the ability to change color and ‘turn on’ (known as CCTO), emitting a much brighter light upon recognition of the target molecule. There are some issues with the use of fluorogenic probes. For example, adding a fluorescent molecule (or fluorophore) into a peptide or ligand capable of binding to the target can sometimes inhibit correct binding, causing a weak link. Moreover, current fluorogenic probes are built only for certain specific protein-ligand pairs, and the search is on for a way to find probes suitable for a wider range of targets. Now, Masumi Taki and co-workers at the University of Electro-Communications in Tokyo, together with co-workers in Japan and the USA, have synthesized a diverse fluorogenic probe library using a form of the fluorescent dye Prodan and phage display technology based on bacteriophage T7. The team selected the protein glutathione S-transferase (GST) as their target for a proof-of-concept study. 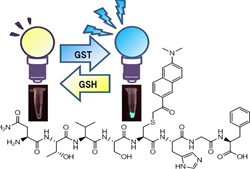 Their probe library yielded GST-specific CCTO probes, which changed color upon binding from yellow to cyan. The intensity of the cyan fluorescence also increased upon target recognition. The color-change ability is most highly prized, because an obvious signal such as this can result in less ambiguous read-outs when searching for specific targets. Further trials using the new probe library will help Taki and his team determine its advantages and limitations. The use of molecules that fluoresce when activated by light, or other processes such as enzymatic reactions, have been used to trace biological processes for many years. Fluorogenic probes can be designed specifically for a certain target – a protein for example – meaning the probe will emit fluorescence upon binding with its designated target. This means that scientists can then follow the activity of a specific protein and monitor its behaviour　for diagnostics applications. In recent years, interest has grown around the development of ‘phage display libraries’, which allow researchers to create vast numbers of molecular combinations in order to find ones that will work as fluorogenic probes for particular targets. In ‘phage display’, new gene fragments are inserted into the genes responsible for surface proteins on bacteriophages - naturally-occurring viruses that infect bacteria. An artificial protein or peptide then appears on the phage surface, and it can be manipulated and used to create a potential linking molecule for a target. The study by Taki and his team involved the chemical modification of T7 phage-displayed peptides by altering the protein gp10 through a process known as gp10 based-thioetherification, or 10BASEd-T. By linking artificial molecule cores containing a form of dye called Prodan on the gp10 region of the T7 phage, the researchers created a vast, diverse library of molecules that could be used as fluorogenic probes for certain targets. Their library produced a number of probes suitable for the team’s chosen target protein, GST. Crucially, the probes changed color and light intensity upon recognizing their target, altering from a weak yellow to a bright cyan light. This means that output results are unambiguous and clear to scientists, making probes such as these highly desirable. Taki and co-workers will continue exploring the probe library using different combinations of core molecules based on other fluorophores. They are hopeful it will prove valuable in the search for CCTO probes suitable for other target proteins. M. Taki1, H. Inoue1, K. Mochizuki1, J. Yang2, & Y. Ito3. Selection of Color-Changing and Intensity-Increasing Fluorogenic Probe as Protein-Specific Indicator Obtained via the 10BASEd‑T. Analytical Chemistry, 88, 1096−1099 (2016); DOI: 10.1021/acs.analchem.5b04687. 1. Department of Engineering Science, Bioscience and Technology Program, Graduate School of Informatics and Engineering, University of Electro-Communications, Tokyo, 1-5-1 Chofugaoka, Chofu, Tokyo 182-8585, Japan. 2. Department of Anesthesiology, University of Wisconsin, School of Medicine and Public Health, Madison, Wisconsin 53706 USA. 3. Department of Chemistry and Bioscience, Graduate School of Science and Engineering, Kagoshima University, 1-21-35 Korimoto, Kagoshima, Kagoshima 890-0065, Japan. The University of Electro-Communications (UEC) in Tokyo is a small, luminous university at the forefront of applied sciences, engineering, and technology research. Its roots go back to the Technical Institute for Wireless Commutations, which was established in 1918 by the Wireless Association to train so-called wireless engineers in maritime communications in response to the Titanic disaster in 1912. In 1949, the UEC was established as a national university by the Japanese Ministry of Education, and moved in 1957 from Meguro to its current Chofu campus Tokyo. With approximately 4,000 students and 350 faculty, UEC is regarded as a small university, but with particular expertise in wireless communications, laser science, robotics, informatics, and material science, to name just a few areas of research. The UEC was selected for the Ministry of Education, Culture, Sports, Science and Technology (MEXT) Program for Promoting the Enhancement of Research Universities as a result of its strengths in three main areas: optics and photonics research, where we are number one for the number of joint publications with foreign researchers; wireless communications, which reflects our roots; and materials-based research, particularly on fuel cells.